My Name is Bob Lynch and I worked with Coach Jerry Kirby and developed your new website. I wanted to introduce a few features of the Site. You have three Team Sections on this site. Phoenix Orange, Phoenix Grey and Phoenix white. Each players page can feature details of each player in an effort to communicate with interested colleges and coaches. It can be reviewed by coaches prior and during a Tournament. Information can be added and changed throughout the season. Each players page can also contain individual photos of play and the ability to host a skills video if a player has one. Note the home page. You will see Social media new feeds for Twitter and Instagram. Be sure and follow the team. ***Tip, if you post softball photos of yourself include the hashtag #phoenixfastpitch It will help the entire web site and your own possible exposure. This "HAPPENINGS" section can be used by the team for any kind of news updates or relevant happenings in your softball world. Please note the small social media icons at the bottom of news entries. It helps if after you read or view photos etc if you hit those buttons, you can share them to your own facebook and twitter pages. Friends and followers will trail you back to this website. "Remember those hastags"
*** Note the hastags added to this post, you may want to add the same to your own social media efforts. It all helps! Facebook and instagram specifically! There is a google calendar which can be updated for public announcements etc. Both the Happenings sections and the calendar are MOBILE FRIENDLY SECTIONS. You have a Gallery section. It contains a slideshow of photos which literally thousands can be added to during your yearly season. The downside is- it doesn't work on a smart phone because the technology of a smart phone is different then a laptop or stand alone computer. There is room for lots of static non moving photos that work on both platforms. 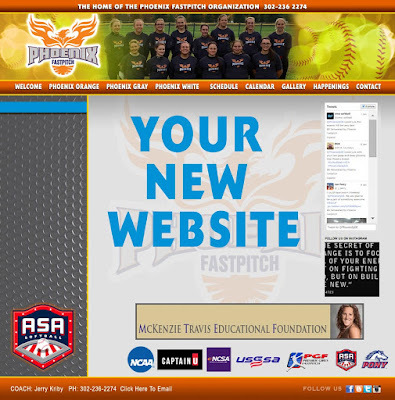 You have a contact section where all the Phoenix Fastpitch members can be contacted. You also have a Schedule section which will be updated for the season and so college coaches can plan for watching you play. Note the bottom of the website. Major softball programs have their logos. You can click on their logo and visit their website. This entire website can grow and expand as your organization and team does. It will constantly evolve. I hope this small tour was helpful. Click away and tell your friends. Best of luck with your upcoming season. Have fun !